In recent days, the San Francisco Board of Supervisors voted to ban restaurants from offering toys with calorie packed children’s meals. In doing so, San Francisco joins Santa Clara County, CA which banned toys from unhealthy children’s meals just last spring. The ban goes into effect at the end of 2011, so fast food chains like McDonald’s have time to change the ingredients in the ever popular “Happy Meal” to total less than 600 calories and under 35% fat in order to continue including toys. The Happy Meal in its current form (cheeseburger, soda, fries) totals 640 calories. Will this Nanny State Strategy work to reduce skyrocketing childhood obesity or deter parents from lining up at the drive thru to buy these unhealthy meals for their kids? Perhaps I should add an “are you kidding?” onto that statement (I really dislike being sarcastic but it is just so hard not to be when stories like this come along). 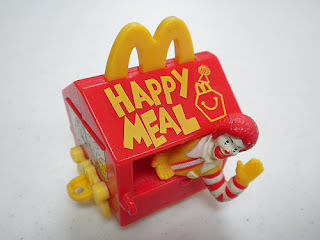 First of all, reducing the caloric content of the Happy Meal from 640 to 599 calories to comply with the ban should not be a difficult feat for the chemists that work their Ingestible Magic at food production facilities that churn out McDonald’s signature franchise foods. Chemicals, after all, taste just as good as the real thing – even better, right? Eating nondecomposing fast food that is essentially more chemicals than nourishment only fools the stomach for a brief period of time so the customer comes screaming back through the drive thru even more quickly for another fix! Hooray for profits! This new law could really get the bottom line smokin’ ! Anytime the government tries to legislate health, there will be trouble. Look at the law that banned transfats in New York City just a few years back. Did this eliminate unhealthy factory fats from processed foods? Food manufacturers just nimbly switched from one unhealthy factory fat (transfats) to another, even more unhealthy, form of factory fat (interesterified fats) and made money off the deal through advertising their new and improved “transfat free” fare! On a side note, isn’t it interesting how the danger of consuming interesterified fats has not even made one media news story yet? By the time the danger of these fats becomes widely known (my guess is 5-10 years), many more folks will have had heart attacks and strokes from consuming these frankenfats. For another example, look what happened when Congress started corn and soy subsidies way back when. Now you can drive across America’s heartland and all you can see for miles and miles are fields of GMO corn and soy. Do most conventional farmers want to grow much of anything else? Heck no. There’s not as much money to be had in fruits and vegetables! What’s more, the diet of Americans has become so overwhelmingly dominated by corn and soy that tests of the source of the carbon material in their tissues come up overwhelmingly corn and soy dominant. In one test, a strand of hair from an American (Dr. Sanjay Gupta, no less!) came up as 69% corn based carbon! In contrast, a strand of hair from someone living in Italy tests around 5% corn based carbon. Ultimately, then, it is up to the parents and caregivers to “just say no” to fast food for children. There will always be snake oil salesmen like the fast food franchises that are more than willing to sell you junk – toy included – for your hard earned cash. No governmental edict will ever change that. Personal responsibility for health is ultimately the best solution.